Eye of Horus slot by Reel Time Gaming takes a classical Egyptian theme and adds some unique features to increase the fun. Strangely enough, they do work. The round of free spins generates some nice wins, when the Horus symbol appears several times in a row, and two gamble features offer several ways to double you win (or blow it). Go play staring contest with a god. The Eye of Horus is not only an ancient Egyptian symbol, that symbolizes royal power and health, and that chicks stamp on their forearms or the small of the back to look all lofty and mysterious. It’s also a slot game by Reel Time Gaming. The game looks kinda simple. The Egyptian symbols on stone tablets are spinning on the reels, and there’s some sort of tomb or temple on the background. The game features an expanding wild symbol, a round of free spins with a special feature, and two different gamble options. Let’s start with the main game. Here you have Horus himself (yeah, that bird-headed dude) as an expanding wild symbol. Whenever it appears, it expands to cover the whole reel and substitutes other symbols. There there are two gamble features, that are available after any win. The first one is almost standard - guess the color of the card and your win is multiplied by two. “Almost standard”, because there’s an option to split you win (take half and gamble another half). The second one is called Ladder gamble. Here you have a ladder of increasing values, and you take your 50:50 chance to step up. Depending on where you start on the ladder, you don’t always lose everything if you guess wrong. If you’re high enough, you’ll just take a step down. In any case, the possible outcomes are highlighted. Here you can also play it safe and take a half of the win. Now, the free spins are unusual as well. Three or more Scatters give you 12 free spins. When the Horus symbol appears, the first symbol in the line (shown above the reels) gets upgraded to the next one. With some luck, all the symbols get upgraded to the Eye symbol, greatly increasing both the chance of a winning combination and the payout values. That’s not all the miracles Horus do - he also gives you more free spins when he drops by. Eye of Horus slot may look boring at first glance, but it have several unusual bonuses that provide fun experience. We also haven’t seen many slots with two distinctively different gamble features. 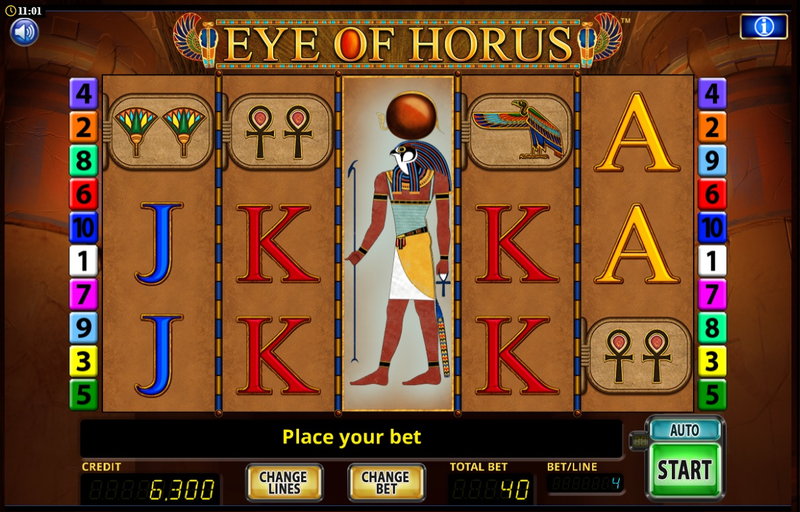 Click here to play Eye of Horus, because one gamble is not enough.